Infrared Bazooka was inspired by a need to remotely control a rogue television which is far away. The Infrared Bazooka is basically an infrared repeater combined with an infrared amplifier. Project date: started July 2007, completed August 2007. 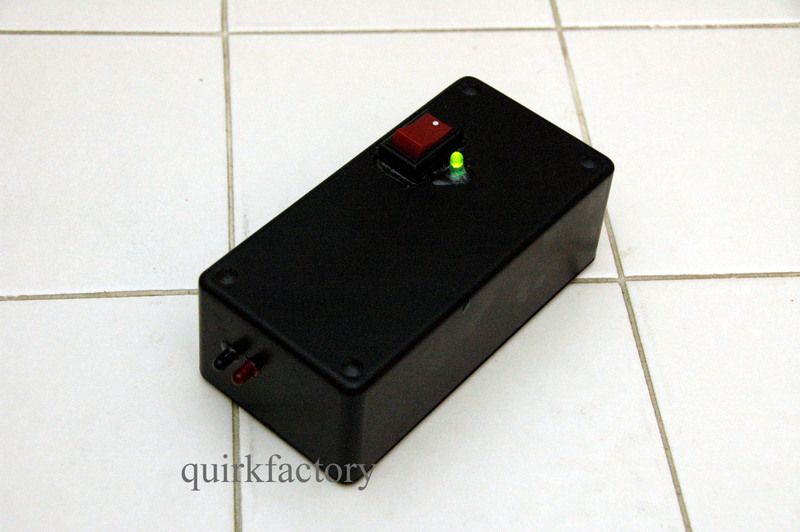 There are cool gadgets for remote control of random TVs, like the TVBGone or the Ninja Remote. The Infrared Bazooka allows you to amplify your remote (of any type) for greater range. 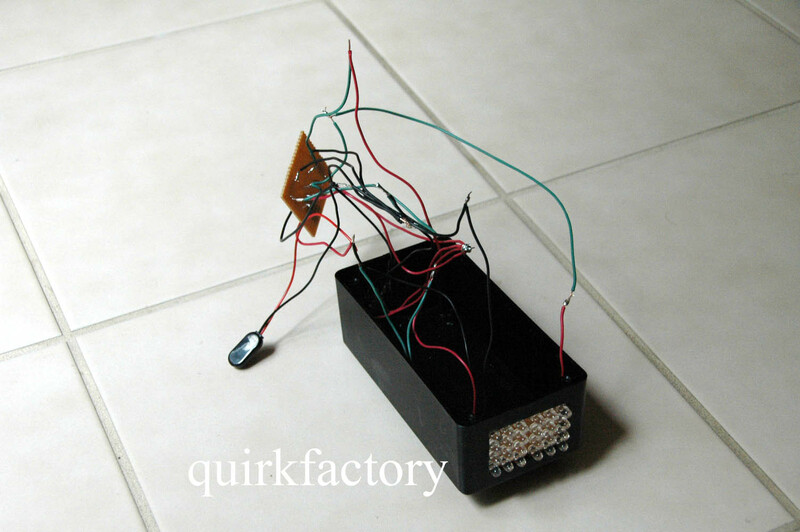 (1) Radio Shack Project box 6"x3"x2"
The heart of the Infrared Bazooka is an array of 24 infrared LEDs. This is what gives the bazooka amplification relative to a standard remote control. For the IR LEDs, I'm using part number CAT# ILED-8 from All Electronics, plus some 20 Ohm resistors I picked up from Fry's. There's a nice LED series parallel array wizard with a calculator to help arrange arrays of LEDs. 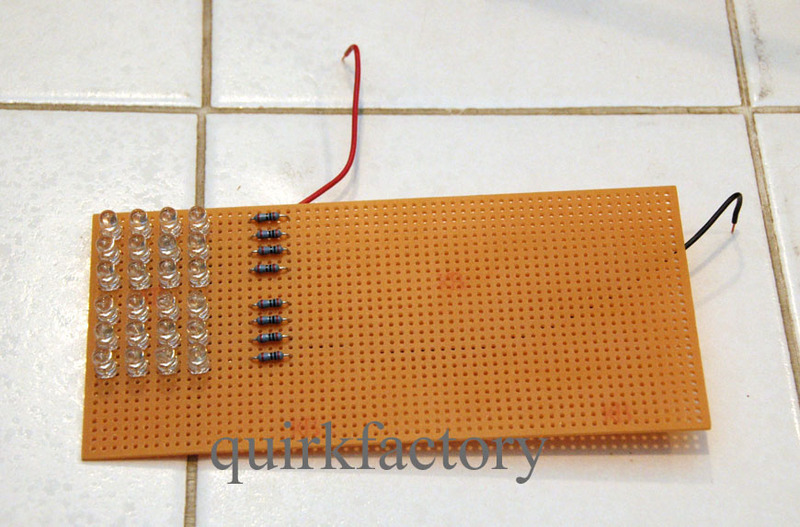 I used 8 groups of 3 LEDs in series with a 20 Ohm resistor. For the driver circuit, I initially tried to use an IR decoder (I was using Radio Shack part number 276-137, but this part looks functionally equivalent) combined with a 555 timer generating a 40 kHz signal to drive the LED array. However, that did not work properly for me, for reasons I don't yet understand. I was roughly following this nice article, but in spite of having good IR output and a signal verified with my scope, the TV wasn't picking it up. Oh well - even if it did work, there's a chance the 555 would be at the wrong frequency for some remotes. Better to just pass the signal through unfiltered. I decided that all I really needed was a pure IR detector/amplifier, without any filtering. So I hooked up a detector from Radio Shack part number 276-142 directly to a transistor powering the LED array. This worked fine - the IR diode detector is not as sensitive as the 40 kHz filter, but in this application it's ok to place the remote nearby the detector. In this unfiltered design, though, you need to make sure strong light (like the sun) is not hitting the sensor. 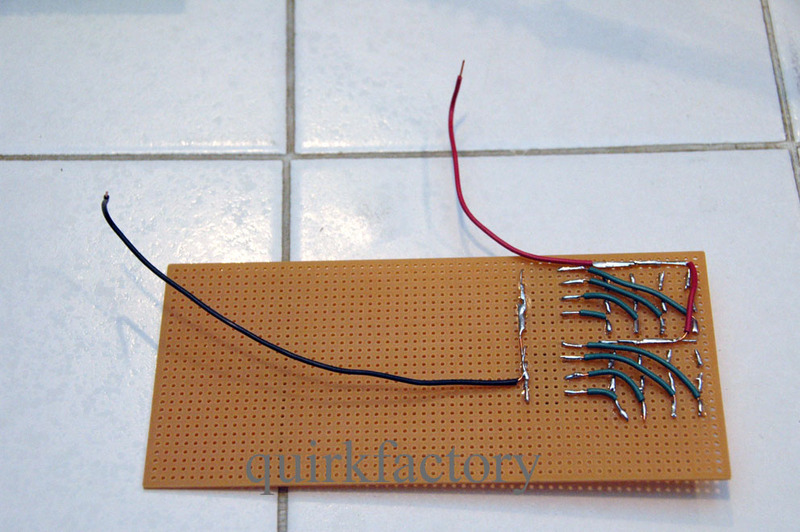 I settled on the following circuit powered by 9 VDC. The amplified signal is strong enough to control my TV even when bounced off a wall 30 feet away. I've updated the schematic to reflect my addition of a large capacitor from +ve to GND. I've also added a second 9 VDC battery, which substantially helped the range. Initially I observed the green power-on LED flashing when the circuit was active - an indication of voltage drop due to insufficient power supply. I haven't yet done a test of maximum distance, but the signal easily bounces off walls 30+ feet away to indirectly control a TV. 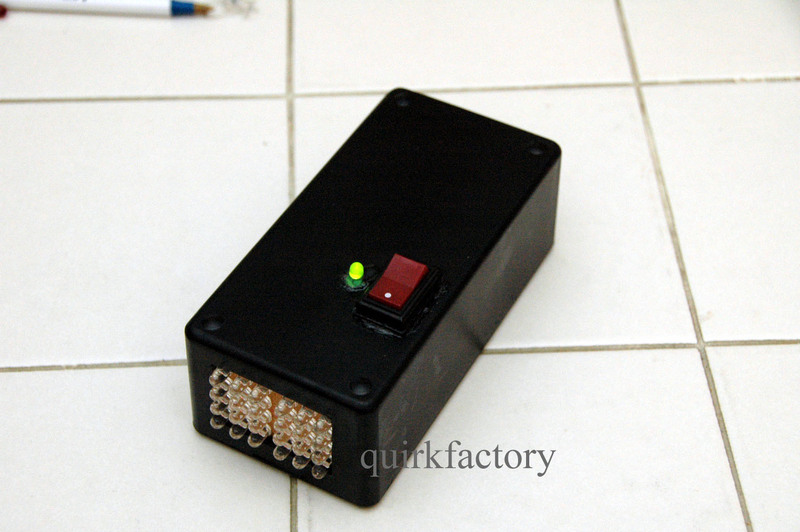 This IR repeater/amplifier has 24 IR LEDs. A nice improvement would be to create an array with 200 or 1000 LEDs, and see how far the signal will travel.